London, October 27, 2018,(AltAfrica) – The fractured opposition in the Democratic Republic of Congo announced Friday that opposition leaders will participate in a contentious December election, and said the opposition bloc will name a unified candidate by Nov. 15 — just six weeks before this pivotal poll. It’s another sign of the volatility — and the fragility — of the situation as the massive and conflict-ridden DRC hurtles toward a long-postponed poll scheduled for Dec. 23. 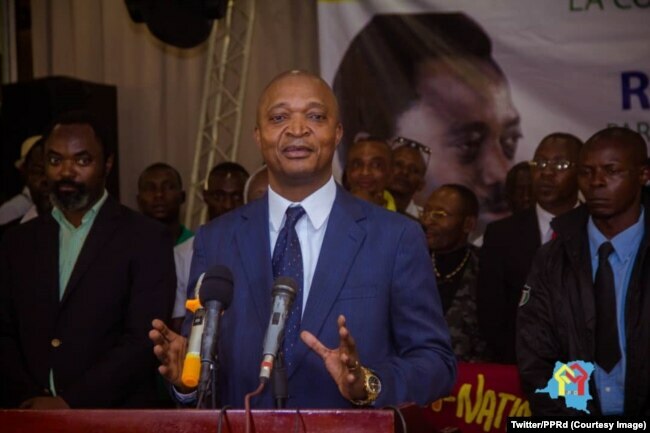 Emmanuel Ramazani Shadary, nominated by President Joseph Kabila for the presidential election scheduled for December 23, speaks at a rally in Kinshasa, Sept. 25, 2018. After two days of discussions in South Africa’s capital, Pretoria, the nation’s seven top opposition leaders agreed on two critical issues, according to a document sent electronically to VOA by one of the leaders on Friday. Vital Kamerhe of the Union for the Congolese Nation (UNC) is seen in Kinshasa, Democratic Republic of Congo, Aug. 4, 2018. Wolters says the opposition field is effectively narrowed to two men: longtime politician Vital Kamerhe and relative newcomer Felix Tshisekedi, whose late father led the nation’s main opposition party for decades. 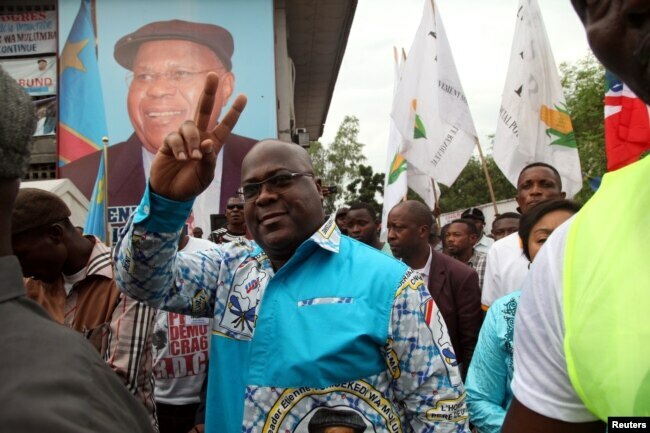 Felix Tshisekedi of the Union for Democracy and Social Progress (UDPS) gestures to supporters in the Limete Municipality of the Democratic Republic of Congo’s capital Kinshasa, April 24, 2017. Mende said he’s confident about the poll, which for the first time will be entirely locally funded after the government rejected foreign funding, accusing the international community of trying to influence the poll. But Wolters says she’s watching closely how things will play out — if the poll happens at all.